I've always gotten along well with Texans. You've got to. Jay Leno is wonderful and a good friend, but it will always be the Carson show to a lot of people. Reynolds hoped to be named to All-American teams and to have a career in professional football; however in the first game of the season Reynolds was injured and a car accident later that year worsened the injury. He was born in the city of Lansing Michigan. In 1962 Reynolds secured a guest appearance on Perry Mason in "The Case of the Counterfeit Crank". 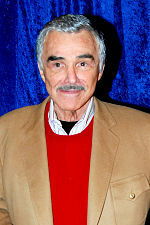 Burton Leon "Burt" Reynolds Jr. Some of his notable roles include Bo 'Bandit' Darville in Smokey and the Bandit Lewis Medlock in Deliverance Bobby "Gator" McCluskey in White Lightning and sequel Gator Charlie B.